LeitOn stands for for a combination of the German word for PCBs, "Leiterplatten" and "Online". Our company was established in 2004. The concept is based on an extended and convenient online calulation for all kind of printed circuits. Special technologies as well as express quick-turn services are available online - Made in Germany. For higher quantities our own staff in China takes care of your mass production printed circuits. LeitOn produces in Berlin, Germany with currently around 35 employees. We manufacture printed circuit board prototypes in express service up to 24-layer multilayers. The Berlin operation is run by technology manager Mr. Mario Gehrau and Mr. Christoph Kendler, the general manager. A highly qualified CAM-team inspects and optimizes all files intensively before going into production. Our friendly, fast and competent sales team prepares easy-to-read quotations for you, from one prototpye up to call-orders, price-matrix and packages for multiple layouts. If you would like to meet us in Person, you are welcome to visit our factory in Berlin or make an appointment with our sales manager Mr. Daniel Hartmann. Mass production are handled by our subsidiary in China with currently around 20 employees: quality manager, project manager, logistics manager, assembly technicians and quality inspection staff. Our direct presence on the Chinese market with a local team and a German general manager, Mr. Marcus Knopp, assure that quality control and packing requirements are implemented according to German standards reliably. Personal contact with our suppliers and a team of Chinese technicians, engineers and even a doctor take care of the necessary "guangxi" (chinese for "relationship"). "You offer a really good service. Whenever something in the documentation is unclear or there is something wrong with my layout you immediately inform me. This already saved me money. I like that a lot. Yes, I'm a happy customer! :-)"
"You can always reach someone, really perfect!!! We NEVER had quality problems with LeitOn. Therfore, our rating is "very good" all over! ALso the way how surplus-production is handled is exemplary. 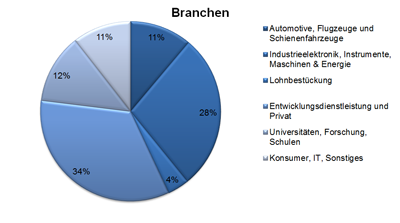 Many German PCB manufacturers jsut deliver 10% more as a "standard". LeitOn explicitly asks every time, whether additional PCBs are desired. As German supplier, LeitOn is our number one." "If it happens that something is not available online, you get a very fast. You always receive competent replies about feasibility and advice for your layout preparation. Very little delays, and if, you always get informed." "Quotations always arrive within maximum 1 to 3 hours, while competitors often need 3 days. Requests for stencil or panel files are handled quickly. The online ordering forms are very well arranged." "I received a call because of some irregularities in my layout. This way an otherwise expensive "fail" was avoided. Perfect!!" "We had some text in our solder mash that was overlapping with some traces. We were informed that this may cause problems later. LeitOn direclty corrected the layout so no time was lost." "If you can produce it, the CAM department will take care of it without insisting on formal design rules (DRC)"
"There has never been anything late." Copper-IMS PCBs are available in our online calculaiton. As a special, you may add thermal-blind-vias to contact the copper carrier directly with plated holes. Rigid-flex PCBs are now available in our online-calculation. You can calculate 2-, 4- and 6-layer rigid-flex PCBs with one flexible outer layer. Rigid-flex PCBs are now being produced in a wide range. This "top of PCB" technology underlines the technological development of LeitOn over the recent years. Impedance calculation and impedance measurements are now available, also in our online calculation. This rounds up the offer of our high-frequency materials. Semiflex PCBs are available online. Through precise depth-milling parts of the PCB are made flexible for installation purposes. This replaces connectors or more expensive rigid-flex PCBs. Megtron6 material from Panasonic is available in our online calculation. This material is an attractive alternative to Rogers materials. LeitOn passes ISO 14001 environmental certification of TÜV Rheinland. Investing in measurement equipment, microscopes and impedance testing equipment allows ever more complex test reports for increasing quality requirements. A plasma etching machine is introduced for optimized Polyimide and PTFE material preparation. FPC express online calculation for flexible printed circuits made in Berlin is introduced. LeitOn established worldwide leadership for flex circuit online calculations. Investing in fully automated e-test equipment and inkjet printer to speed up cycle times while improving quality. 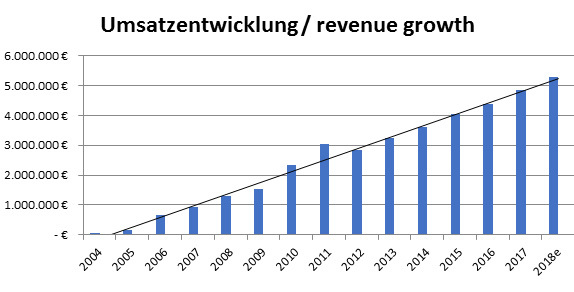 2014 With an investment quota of over 25% LeitOn is pushing to become one of the technology leaders in German PCB production. Rigid-flexible printed circuits and high layer multilayer PCBs up to 24 layers are possible with the investment in direct imaging technolgy. 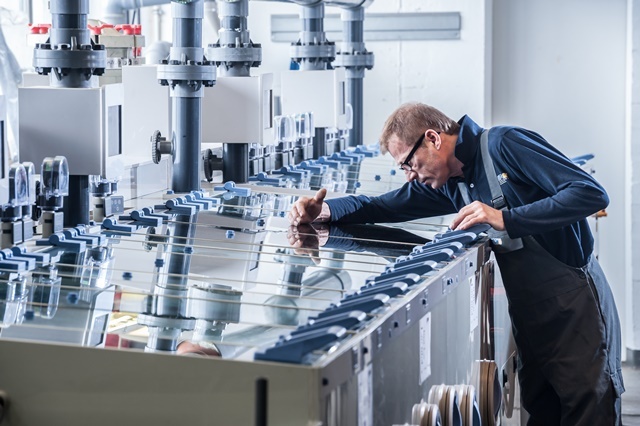 New multilayer-lamination machines increase capacity, lower engery costs and allow precise baking procedures for hybrid-stack-ups thanks to electronically controlled programming. Market leadership in printed circuit board online calculation extends even further by offering Rogers-HF-PCBs, double-sided aluminium-core IMS-PCBs and up to 14-layer multilayers with a wide range of special options in our online calculation. 2013 Mr. Mario Gehrau is taking over LeitOn's technology management. His longstanding experience in one of the leading German PCB suppliers make him the perfect match for this position. He will take on quality imporvements, technology developments and process implementations for improved reliability. LeitOn invests in a new jump-scoring machine and a Schmoll doulbe-head-drill-routing machine. Extremely precise routing with camera adjustments and target-z-axis routing are now possible. Several special projects like integrated stainless steel in a 9-layer multilayer, 4,2mm thick doulbe-copper core multilayer for improved heat management, multialyers with integrated coils, several z-axis-projects with milling for contacting inner layers have been successfully manufactured. LeitOn is now UL-certified for a variety of laminates. The SMD-stencil online calculation introduces many new options, including our LeitOnSparFix-stencil in A4-size for only 29,- Euro. Standard-stecils like Quattroflex/Stencilman, Zellfle, DEK/Alpha-Tetra/Micromount, VectorGuard and Metz are also available in our online calculation. Customization like edge guards and nano coating are also available online. Single layer Aluminium-IMS PCBs are available online. LeitOn offers way more options for material thickness, copper thickness and thermal conductivity, such as 1,3 W/mK or 3,0 W/mK than the competition. Express-Medium-Production is available as "Turbo-M-Series" with up to 2,5m² PCB area within 5 days - Made in Germany! A free online tool "PCB-Toolbox" is available on our webseite and as iPhone-App. Layout designers, engineers and purchasers can find useful functions to estimate printed circuit board related questions such as: trace heating, heat management with aluminium and impedance estimations are only some of the possibilites. A new slogan "count on best service!" and a new logo reveal LeitOn's focus: wide range of options, fair priced and exceptionally fast response times. The team in Berlin expands further. New office space is leased and we launch a vocational training program for an industrial business management trainee. Our team in China now consist of ten people who check and coordinate mass production printed circuit boards directly on site. LeitOn positions itself in the area "Service & PCBs". Inquiries are processed at exceptional speed and customers all over Europe are enthusiastic. LeitOn introduces new options in our online PCB calculation like 0.20mm drills, blind-vias and panel production based on you drawings. LeitOn expands its service enormously. The Ocean concept offers a wider range of options. 12-hours quick-turn prototypes, medium volume series up to 4m², flexible printed circuits online, SMT-stencils and much more is available online. Additional product areas are introduced, making LeitOn an all-around service provider in the electronics sector. Assembly for mass production can be offered on request, as well as layout design service. LeitOn continuous to grow and opens a branch in Hong Kong in order to optimize sourcing from China. All products are RoHS/WEEE compliant and fulfill the latest environmental standards. The team in Germany grows to eith employees. After just a short time 5 people are working for us in Hong Kong and China. Additional services are added to our portfolio. PCB mass production from China, PCB prototype assembly in Berlin, various special productions, PCBs with aluminum cores or carriers, thick copper and for high frequency functionality. Happy Birthday! www.leiton.de goes online! Founded by two students, Christoph Kendler and Marcus Knopp, the first orders calls are answered during lectures in university. LeitOn grew by 7% in 2018 to an annual order volume of 5.1 mio. Euros. 2019 started promising, likely hitting around 7% growth this year. Incoming order target for 2019 is 5.4 mio Euros. Growth driver in 2019 was the continued improvement of larger series orders, also using our convenient frame order and stock-call system for mass production. We expect this field to continue driving growth over all technologies. LeitOn currently has over 2000 active customers. We are aimig to keep this on a constant level and drive growth through imrpving customer relations rather than growth of customer base. We would like to kindly express our gratitude for your trust! LeitOn serves a broad spectrum of industries with various PCBs. Industrial electronics continue to remain the main driver of LeitOn's business growth. IT and Automotive are consolidating on a high level, thanks to successful quality initiatives.